احمدیان آروق, مهین. (1389). دمتیلاسیون متوکسی متا ـ ترفنیل ها. نشریه شیمی و مهندسی شیمی ایران, 30(1), 99-105. مهین احمدیان آروق. "دمتیلاسیون متوکسی متا ـ ترفنیل ها". نشریه شیمی و مهندسی شیمی ایران, 30, 1, 1389, 99-105. احمدیان آروق, مهین. (1389). 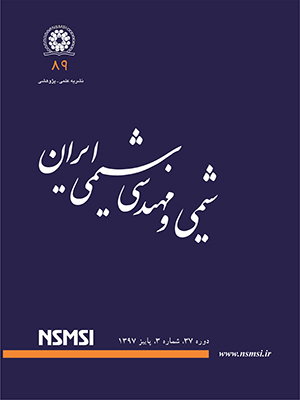 'دمتیلاسیون متوکسی متا ـ ترفنیل ها', نشریه شیمی و مهندسی شیمی ایران, 30(1), pp. 99-105. احمدیان آروق, مهین. دمتیلاسیون متوکسی متا ـ ترفنیل ها. نشریه شیمی و مهندسی شیمی ایران, 1389; 30(1): 99-105. در این پژوهش, متوکسی متا- ترفنیل‌ها با استفاده از محلول بوران تری برمید در دی‌کلرومتان و دردما°C10- دمتیله شدند. متوکسی متا- ترفنیل‌‌های مورد استفاده شده ازواکنش متوکسی آریل ـ گرینیاردها با 2،6-دی کلرویدو بنزن درحلال THF و درحال رفلاکس تهیه شدند. D.Doi J., Compito-Maglizzo C., Lavallee D.K., Dealkylation of N-methyl-5,10,15,20- Tetraphenylporphine by Palladium(II) in Acetonitrile, Dimethyl Sulfoxide, and Dimethylformamide, Inorg. Chem., 23(1), p.79 (1984). Robert A., Stockland Jr., Diane L., Maher, Gordon K., Anderson, Nigam P., Demethylation of Trimethylphosphite Promoted by Dichlorodiphosphineplatinum and Palladium Complexes, Polyhedron, 18, p. 1067 (1999). Kasahara H., Miyazawa M., Kameoka H., O-demethylation of 7,7'-Epoxylignans by Aspergillus Niger, Phytochemistry , 43(1), p. 111 (1996). Shashi P. Singh, David E. Moody, A Radiometric TLC Assay of Liver Microsomal Dextromethorphan O-Demethylation, Journal of Pharmaceutical and Biomedical Analysis, 13, p. 1027 (1995). Tirthankar G., Harold H., Synthesis of Triarylbenzenes via Tandem Aryne Reactions of Aryl Grignards with Polyhalobenzenes, J. Org. Chem., 53, p. 3555 (1988). Harold H., Katsumasa H., Chi-Jen F., Synthetically Useful Aryl-Aryl Bond Formation via Grignard Generation and Trapping of Arynes. A One-Step Synthesis of p-Terphenyl and Unsymmetric Biaryls, J. Org. Chem., 50, p. 3104 (1985). Perumal R., Muthialu S., Meta-Terphenyls as Buiding Blocks for Benzimidazolophanes, Tetrahedron Letters , 38(30) , p. 5323 (1997). Arunachalam K., Perumal R., Kabaleeswaran V., Rajan S.S., Synthesis of Cyclophanes with Intra-Annular Functionality and Cage Structure, J. Org. Chem., 61, p. 5090 (1996). Perumal R., Arunachalam K., Synthesis of Functionalised Cyclophanes with Cage Structure via an Unusual Termolecular Collision, Tetrahedron Letters, 34(51), p. 8317 (1993). Furniss B.S., Hannaford A.J., Rogers V., Smith P.W.G., Tatchel A.R., "Vogel’s Text Book of Practical Organic Chemistry", 4th edition., Longman, London and Newyork, pp. 935-937 (1989). Perrin D.D., Arm W.L.F., "Purification of Laboratory Chemical", 3 th edition., Pergamon. Newyork, pp. 382-385 (1993). LuningU., Baumgartner H., Manthey C., Meynhardt B., Concave Reagents. 20. Sterically Shielded m-Terphenyls as Selective Agents in General Protonations, J. Org. Chem., 61, p. 7922 (1996). Ehud Keinan, Doron Eren, "An Improved Method for SN 2 - Type Demethoxycarbonylation of Activated Esters with 4-Aminothiophenol and a Cesium Catalyst, J. Org. Chem. 51, P.3165 (1986). Jayaram R. Tagat, Stuart W. McCombie, Beverly E. Barton, James J., Jennifer Sh., Synthetic Inhibitors of Interleukin-6 II: 3,5-Diaryl Pyridines and Meta-Terphenyls, Bioorganic & Medicinal Chemistry Letters, 5(18) , p. 2143 (1995). Elmorsy S.S., Pelter A., Smith K., Trimerization of Acetone, Tetrahedron Letters , 32(33), p. 4175 (1991).